Preheat oven to 425°. Combine 6 cups water and 1/2 of the lemon juice in a large bowl. Cut off top 1/2 inch of each artichoke. Cut off stem of each artichoke to within 1 inch of base; peel stem. Remove bottom leaves and tough outer leaves, leaving tender heart and bottom. Cut each artichoke in half lengthwise. Place artichokes in juice mixture. Drain artichokes; pat dry with paper towels. Combine artichokes, 1/2 of the olive oil and FISH FACE sea salt then toss well. Arrange in a single layer on a baking sheet. Bake at 425° for 15 minutes or until tender, turning after 10 minutes. For the Aioli: Combine remaining lemon juice, remaining olive oil, mayonnaise, garlic, and additional FISH FACE in a small bowl. 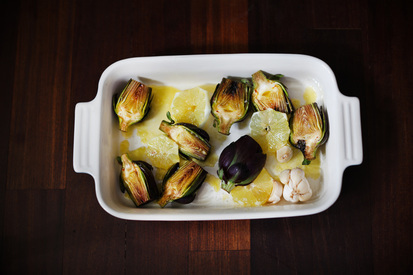 Serve aioli with artichokes.